I go to a lot of food events. 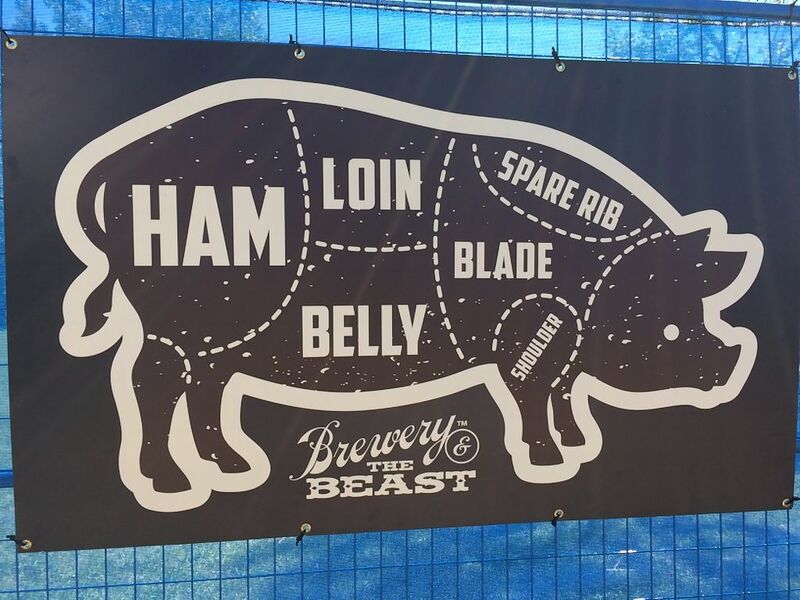 So when I heard that Brewery & The Beast was going to happen in Calgary this summer I debated whether I wanted to make the three hour drive to attend a meat festival. One bite in and I knew we made the right decision. Thankfully my roommate Marc, The Spaniard and I scored a ride with Blaine, who was driving down to volunteer for the event (which was great since we were all slightly hungover). The weather could not have been more beautiful for an outdoor afternoon event at Pumphouse Park. The staff and volunteers were friendly and organized – we quickly had our IDs checked and were given a custom board designed to hold a tasty alcoholic beverage and multiple servings of meat. Our first stop was to visit my friend chef Michael Allemeier at the SAIT culinary booth who was wielding a cleaver breaking apart pieces of slow-smoked pork shoulder from Hill View Colony and topped with hand-picked Evans Cherry BBQ sauce. It was of course amazing. Oh, and Chef Allemeier graciously shared his Evans Cherry BBQ sauce recipe with me. After that we were a bit confused on where to go next. We kept thinking we should walk around and check things out, but everywhere we turned there was another chef from one of Calgary’s hot list of restaurants handing out a variety of savoury meats. I was glad to see that Chef Ryan O’Flynn of The Westin Edmonton representing YEG at this year’s Brewery & The Beast in Calgary. Chef O’Flynn’s dish was serving up wild pine cured brisket of bison with ancient grain and heirloom corn bannock, birch tree reduction, and northern condiments. While this gluten-free girl couldn’t partake in the bounty of beer, I did enjoy some cider from Left Field Cider Co. The beer table appeared to be quite organized, with short lines. We had to find some shade and take a time out from eating. The band kept up entertained until we were ready for another round. I was feeling a serious passion for Alberta pork love throughout the afternoon. I was stuffed but I managed to squish in a few more things (the chefs were very persistent and I didn’t want to insult anyone). Chef Jamie Harling of Rouge Restaurant made me a custom grilled beef tongue sandwich on gluten free bread. The chef at The Fairmont Palliser was not taking ‘i’m full’ for an answer. Somehow I made room for their honey & chipotle smoked brisket tacos; glad I did as they were lovely. Just a few hours in and we realized our Brewery & The Beast rookie mistake. We should have got one portion for the three of us to share; our gluttony had gotten the best of us. It was one of the best food events I have ever been too, and I will happily drive to Calgary for Brewery & The Beast again. However, I am hoping that they drive up the QEII for a pit stop in Edmonton next year – bring the beast to YEG! Next PostTake me out to the ball game… and then up the CN Tower.